First of all, some rules never seem to change. Making a living in the post-corporate world depends on getting your products and services in front of the right people at the right time. Big deal, you say. So how does an individual accomplish this if larger companies struggle with this and fail? I think both have the same success rate. Some micro-businesses fail and some succeed spectacularly. The biggest difference is speed of execution and speed of recovery. In a large corporation, a product launch of eighteen months is considered fast. Entire markets can appear and dissolve in less time than that. A small company can change its product mix in less than a week. How does this apply? If you find a venue with buyers and they aren’t buying your product, you go back home and revise your product offerings to match what prospects are asking for. The key is to ask customers what they want, if they are not buying what you have. (1) finding a supply of prospective customers and (2) presenting them with products they need, want, and are prepared to pay for. The small business has more venues now than ever before. Ebay offers access to millions of prospects. At the other end of the spectrum, farmer’s markets, craft shows, flea markets, and carts in malls offer access to prospects at widely varying costs. Success depends on finding an appropriate sales location that you can afford. I have been selling Affordable Designs in Wood for about two years now and have gradually developed a sense of what people want and are willing to pay for. I have been promoting locally through word of mouth and through my Box-Carts website. Now I have found another venue with prospects who can afford my services and I am expanding to meet the demand. My current venue of choice is the City Market in Charlottesville. It’s not for everyone, because it is only open 5 hours a week in an outside location. The people who shop there are looking for produce and baked goods. Craft work and jewelry are not at the top of their list. Most of the buyers are city dwellers, but there are regular visitors from affluent enclaves outside the city. People do not linger to shop as the temperatures are stifling at this time of year. The vendor turnover is very low and there are 8 pages of names on the waiting list for assigned spaces. 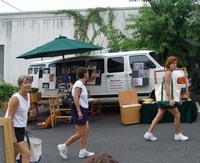 For a quick tour, see the C’ville Market Photo Album on the left sidebar. This venue is attractive to me because there is a high percentage of regular patrons who return week after week. They have their regular stops, but they notice new booths when these appear on the outskirts of the market. I have seen a pattern of visitors to my booth. People will walk by one week and idly observe that I am there. The next week, they will say hello and may take a business card. Later, we will get into conversation and discuss a possible design solution for some problem they have. Sometimes this develops into a design and a proposal. I sell very little at the show, because most of my pieces are too large to put in a car. Instead, I develop a relationship with these people which eventually results in a referral or a purchase. 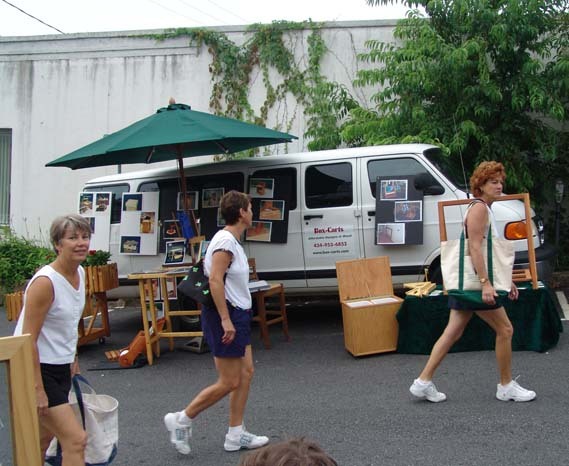 My friend, Jeanette Caruth, does very well at these non-craft fair venues. Her paintings now sell in a much higher range than a few months ago, and she can barely keep up with demand. Although her work regularly appears in galleries, she find most of her new customers at carefully selected farmer’s markets. Painting is now a full-time occupation for her and she built her customer base by frequenting weekend markets until she found the ones that worked for her. I interviewed a number of independent business people and will discuss their particular enterprises in future posts. Can you envision life outside the corporate mothership? What if there was no choice? This entry was posted in Micro-Business, post-corporate. Bookmark the permalink.